This was my first night photography session. 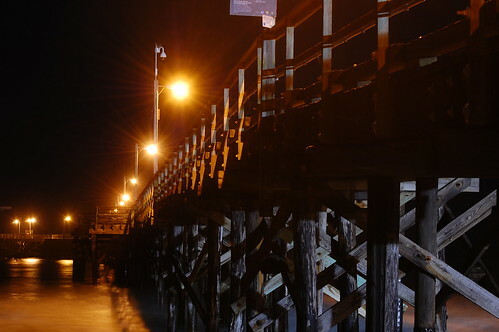 I chose the pier at Goleta Beach in Goleta, California. 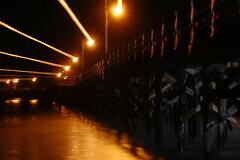 I took several pictures of the pier with different settings to create different images. This photo to the right was taken with a zoom effect technique I found online. In my shot, I used my Nikkor 55-200mm zoom lens with the focal length set at 55mm. While the shutter was still open, I zoomed very quickly to 200mm and then back to 55mm before the shot was complete which created the rays from the light posts on the pier. More information about the zoom effect can be found at Digital Photography School.com. This photo was taken on my second trip to Lake Casitas. I have never actually been to Lake Casitas but I've viewed it from afar. On this day, I specifically went to take a panoramic shot of the lake. I took several pictures of the lake with the camera on a tripod but I didn't need to use the tripod. I used Autostitch to stitch this shot together. I found Autostitch from another blogger and it's amazing. Autostitch has a free version and a professional version. Ken Rockwell's site also lists several other panoramic software. Today, I entered two of my photographs in the Santa Barbara Museum of Natural History Photo Contest. The contest is to promote their mission statement: "inspiring a thirst for discovery and a passion for the natural world." The contest will be judged on creativity, technical skill, and interpretation of the theme. The winners will be announced on March 26. This is my first photography contest and I am so excited! Two of my friends, Allen and Bea, entered the contest too and I'm so excited for them as well. I'm not sure if this is their first competition but hopefully they'll stop by the blog and let us know in the comments. My two submissions were titled Reflection of Nature and More Than Just a Decoy. Both photos were taken in Santa Barbara. 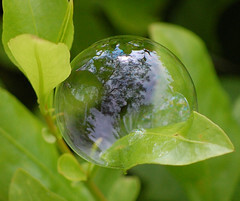 Here's a smaller image of Reflection of Nature. If you entered the contest as well, good luck to you also. 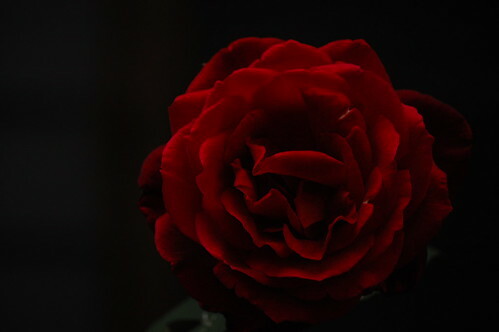 I absolutely love roses so there will be lots of rose photographs in my Flickr album but this picture is so far my favorite one. My First Feature - Schmap!! I have blogged about this before on another blog of a different theme but since this is my photography blog, I thought I'd share this story on this blog also. This was the first photo that I've ever taken that has been showcased outside of my Flickr gallery. The Managing Editor of Schmap contacted me in March 2009 to feature one of my rose photographs from the Exposition Rose Garden in the sixth edition of Schmap Los Angeles Guide! I just realized that it was a year ago today that this photo was featured. Schmap is a leading publisher of digital travel guides for 200 destinations throughout the United States, Europe, Canada, Australia and New Zealand. 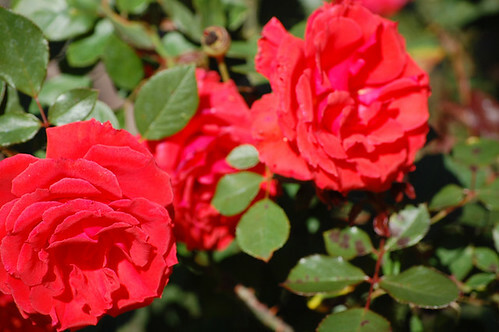 Here’s the link to my photo from the Exposition Park Rose Garden (photo is on the top right and credited with my name). If you use an iPhone or iPod touch, then this same link will take you directly to my photo in the iPhone version of the guide. On a desktop computer, you can still see exactly how my photo is displayed and credited in the iPhone version of our guide at this link. Finally, if you have a blog, you might also like to check out the customizable widgets of the Schmap Los Angeles Guide. Pictures have been a part of my life since as far back as I can remember. I can remember playing with my parents Polaroid camera and begging them to pass me the Polaroid so that I can shake it until the image was visible. 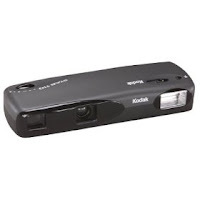 I got my first Kodak camera that used 110 film when I was about 6. Remember those? I have shoe boxes, organizers, and photo albums of pictures that I took from that age until now. For over a decade, I was the #1 purchaser of disposable cameras until one day my boyfriend in college bought me one of the most amazing gifts I had ever received...a digital camera! Digital cameras had been around for a while before I got my first one but I was too caught up in capturing the memories that I didn't stop to check out the latest ways of capturing those memories. 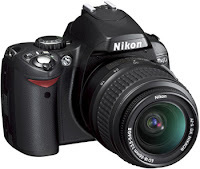 Now, I have a Nikon D40 D-SLR camera with 18-55 mm and 55-200 mm lenses and an SB-600 flash and I'm ready to capture more precious memories and share my view of the world through my camera lens. I hope you enjoy browsing through my photography blog as much as I'm going to enjoy taking the photographs!